Halftone – A series of large and small dots that represent image areas of a continuous tone image. Continuous tone artwork can be converted into printable halftone dots using a process camera or by scanning into a computer and outputting onto film or paper as a series of dots. Even the photos in magazines are printed as a series of halftone dots. They are just smaller than we use in garment printing. LPI – Lines-per-inch – This actually refers to the number of dots-per-inch in a halftone but the term is LPI and NOT DPI. You can see where LPI and DPI can get confused. This term is also known as the frequency in computer graphics (frequency of lines-per-inch). 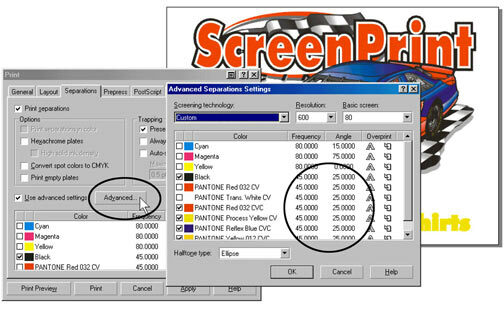 The standard LPI of a screen printable design is 35 lpi to 45 lpi for cartoon type work and from 55 lpi for manual process prints to 65 lpi for automatic process prints. The higher the number the smaller the dot and the harder it is to put on a screen. Percentage – The amount of coverage in a halftone dot is called Percentage or Tint. A 10% dot is much smaller than an 80% dot. When screen printed, a dot grows in size. This is called dot gain and it can be as much as 30% when printing on an automatic press and 40% when using a manual. For this reason you should try not to apply any tints in designs above 70% (they will just grow and be a solid). It is also important to take into account dot gain when using tints. Always use a smaller tint percentage than you think because in most drawing programs you cannot specify the dot gain (you can in Photoshop!). Shape – Dots are also used in various shapes than range from diamonds, to squares, circles and ellipses. An elliptical dot is the best to use because it tends to chain together and is easier to burn on a screen and the dot gain will not be as noticeable in the midtone range. Angle – The angle of the dot is the angle at which the dots chain together. The problem with most computer graphics programs is that the angles of the halftones are generally great for offset printing but not good for screening. A lot of computer programs use 45 degrees as the default angle. Actually, 20 to 25 degrees is good for basic halftone work. If you are doing a process color job you can try Cyan 15, Magenta 45, Yellow and Black 75, or Cyan 22.5, Magenta 52.5, Yellow and Black 82.5. But, a lot of work is now being done at one angle for all process colors. Try 22.5 or 25 degrees. It works! Moiré Pattern – A moiré is an interference of two patterns. It generally has a checkerboard pattern to it. You get moiré’s when using patterns on patterns – as you do when you put halftone dots on screen mesh and/or halftone dots on screen mesh on a shirt pattern. Moiré patterns can be reduced or even eliminated by using a different angle (see Angles) and using a higher mesh count in relation to the LPI of the halftone. The general rule of thumb has been that to reduce moiré patterns use a mesh that is 4 to 5 times the LPI. In example, when using a 50 LPI halftone, a mesh count of 200 would be a good start. There have been lengthy articles written about moiré. DPI – Dots-per-inch. Generally used to describe printer resolution and often used to describe scanner resolution. Obviously the higher the number the better the resolution of the image. By doubling the number the resolution actually becomes four times larger. In the old days (a few years ago) 300 dpi was the norm for a laser printer. Unfortunately, at 300 dpi, the edges of the image were still a little ragged and at 300 dpi a halftone will only generate around 16 gray levels. A 600 dpi halftone will give you over 300 gray levels. DPI is also used as the designation for a scan. Like printers, the higher the number the higher the resolution. Most scanners default to 300 dpi when they should really be set much higher when scanning line art. PPI – Pixels-per-inch – This is actually what a scanners resolution should be referred to. PPI is the same as DPI and you see the terms used interchangeably. SPI – Samples-per-inch – This is the same as PPI and again is really how we should talk about a scanner’s resolution. You see SPI in some scanner ads. It is the same as PPI and DPI. I know that this may be much more information than you need but you must get the vernacular down. You know… I scanned the job at 600 dpi and printed it on a 250 with at 45 LPI ellipse at 20 degrees and didn’t get any moiré.